A couple of weeks ago we had family baby shower for one of my sisters-in-law. She’s expecting her first boy and I thought it would be nice for the girls to get together, go out for dinner, and leave the kids at home! 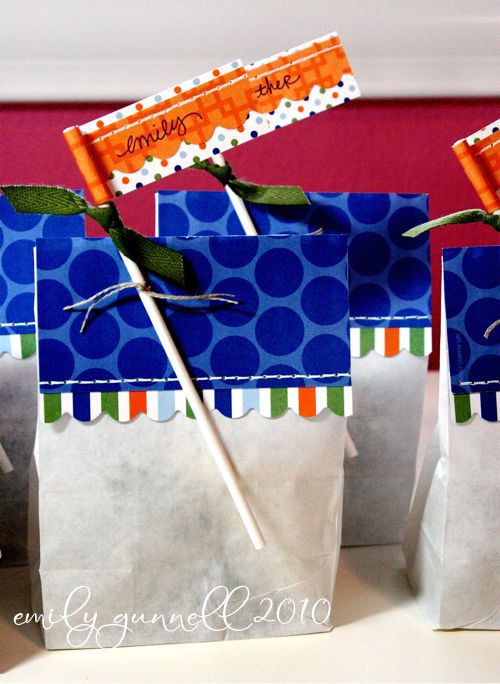 Even though it wasn’t a big family and friends shower, I still wanted to do some cute favors. I found some yummy chocolate dipped short bread cookies at my local Costco. I put them in individual cellophane bags and put two in each favor bag. Then I had fun decorating the bags! I love the little pennants and flags I’m seeing everywhere, so I took that bit is whimsy and made flags for our names. I used lollipop sticks and secured them to the bags with twine. It was such a fun night eating at Olive Garden, visiting, and watching Tiffany open her presents for little Dylan! We all learned that time with just the girls is so much fun and hopefully something we can do more often! All the Dads did such a good job watching the kids that I think we could pull this off more than once every 14 years! LOL!! The favors are so cute. Great idea to keep the occasion festive.